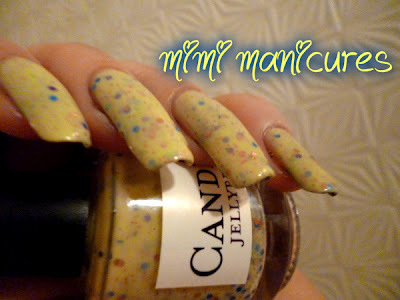 My franken version of this polish is quite accurate, in the real JellyBean there looks to be pieces of smaller glitter which my dupe doesnt have. However it is near enough to calm my lemming until I can get my hands on the Candeo version! 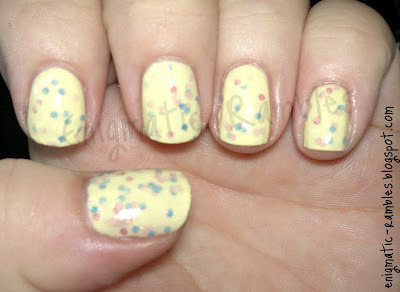 I used W7 Sheer Lemon and Claire's Accessories Slice of Shine in a jelly sandwich to create my dupe. The lovely Mimi Manicures was kind enough to swatch the elusive Candeo JellyBean for me and to allow me to use the photos for this post. Not only is the polish stunning, look at the length of those amazing nails, ahh makes me wish mine would grow quicker and back to their normal none nubbin length! "Now this isn't a bright sunshine yellow, its much more softer and girly, I'm not overly enthusiastic over yellows but this is a lovely polish alright! 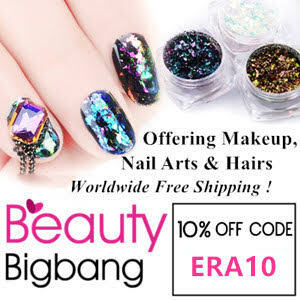 it is scattered with pink, purple and blue glitters. I think the blue glitters look uber cool! Application was lovely on this, although sheer with the first coat, the colour built lovely. 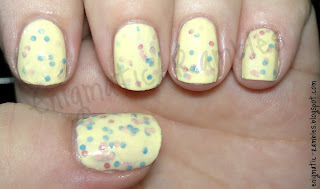 I used 3 coats for the pics and with one coat of seche it was smooth as a babies bottom!" 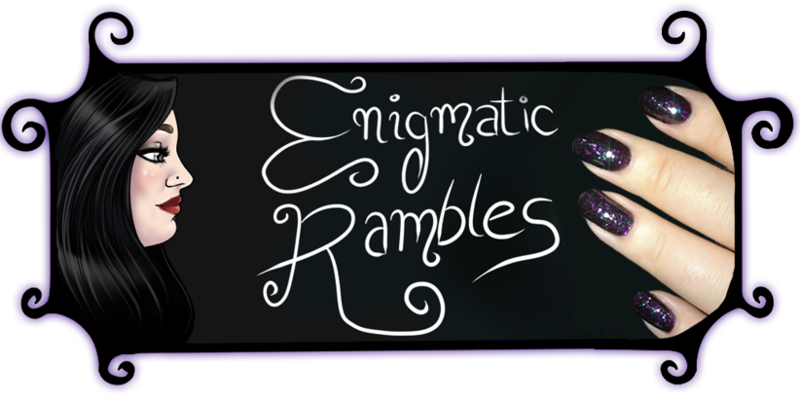 Go check out Mimi's Manicures and her amazing nails, and of course blog!